From mild to wild, choose the suspension package from Radflo and Total Chaos that fits your budget and the terrain you want to dominate. 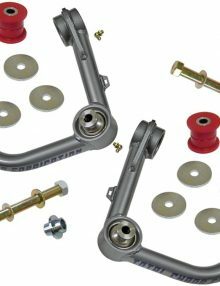 Radflo/Total Chaos complete suspension kit. Radflo Suspension is the pinnacle in both performance and ride quality. After many years of using their products, we have developed 7 different levels of suspension kits to fit your needs. The Radflo front coil-overs are the perfect blend of performance, ride quality, and price for your Toyota truck. The Coil-overs are custom valved for the vehicle and offer a huge improvement in ride quality and performance on or off the road. 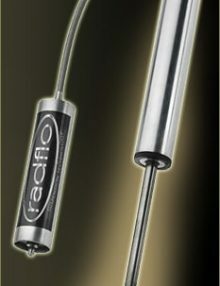 Radflo coil-overs come pre-loaded with world renowned Eibach coil-springs and are available with Remote Reservoirs and easy click dampening control. The Total Chaos commitment to customer service and building the highest quality bolt-on TOYOTA suspension systems and accessories has escalated TOTAL CHAOS to a level of global racing recognition. TC parts are currently exploring off road trails and rally racing on every continent excluding Antarctica. The fabrication specialists at TOTAL CHAOS pride themselves on manufacturing only the highest quality hand crafted parts. TEAM TC is dedicated to constant innovation. 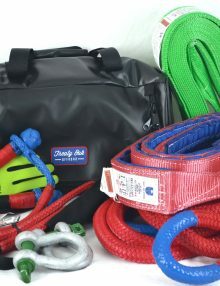 Several of our concepts have been industry break through, and our designs can be seen implemented by several other manufacturers. The increased shock diameter allows for more oil flow through the piston over oem struts which in turn delivers better dampening and cooling. 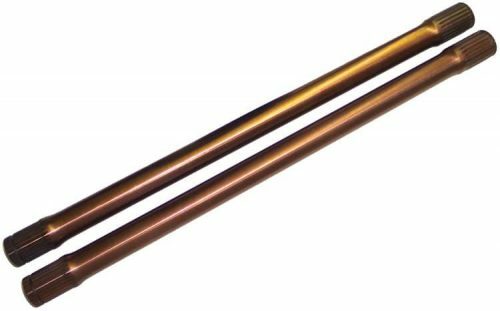 Choose between the 2.0″ or 2.5″ diameter. These shocks are built to the same tolerances and quality as our race proven off road shocks and bolt right on your vehicle. The front coil-overs are adjustable up to 3 inches of lift and allow fitment of up to 285/70-R17 tires. The rear springs offer 20% more spring rate and 2″ of lift for increased load carrying capacity and improved off road capability. Building off of the Stage 1 system, Stage 2 adds the extra oil carrying capacity of the external reservoir. This allows for even MORE oil cooling and capacity through the piston over the Stage1 system which in turn delivers better dampening and performance. Whether your blasting through Baja or driving down a pot hole riddled road, you can count on these shocks to keep their cool. 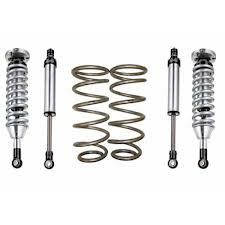 These shocks are built to the same tolerances and quality as our race proven off road shocks and bolt right on your vehicle. The front coil-overs are adjustable up to 3 inches of lift height and allow fitment of larger tires. The rear springs offer 20% more spring rate for increased load carrying capacity and improved off road capability. Beyond adding additional oil carrying and cooling capacity, the next upgrade in performance lies with the down travel of the suspension. By upgrading the upper control arms to a Total Chaos tubular uniball setup coupled with the extended travel Radflo components, the suspension wont be limited anymore by the stock control arms for down travel. Keeping your wheels on the ground is tantamount to keeping traction and with additional down travel you’ll be able to easily climb obstacles that would have put you on three wheels with loss of traction before. Building off of the stage 3.5 kit, this package includes the remote reservoirs with adjustable dampening control. Easily adjusted by hand, this provides you with the ultimate in customization for whatever terrain you encounter. Quickly adjust your dampening from stiff to compliant on all four corners of your truck by turning a click knob located on the reservoir. 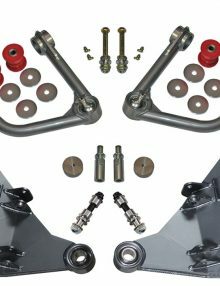 Building off of the stage 4 kit, this package includes Total Chaos’s stock length fully boxed front lower control arms which incorporate 1″ uniball’s that replace factory lower ball joints. 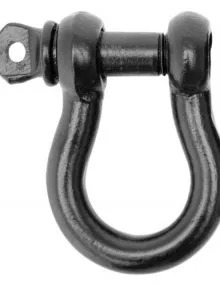 Lower pivots include replaceable urethane pivot bushings & zerk fitting for easy maintenance. These also allow for a dual shock setup for even more dampening performance. (2) Total Chaos fully boxed and gusseted stock length lower control arms. 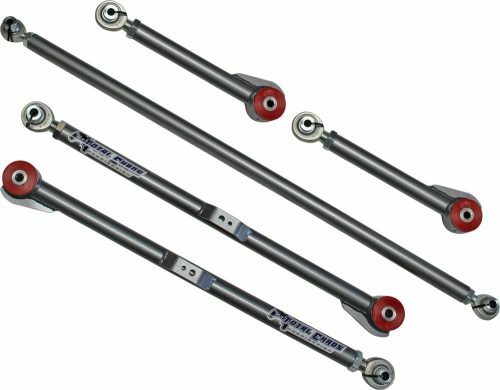 Adding to the stage 5 kit, this package includes Total Chaos’s chromoly adjustable rear links. 100% bolt on. 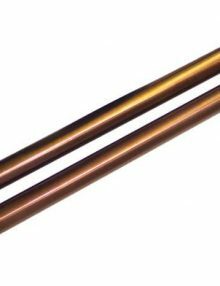 Constructed from 1 1/4″ .375 wall 4130 chromoly tubing for maximum strength. 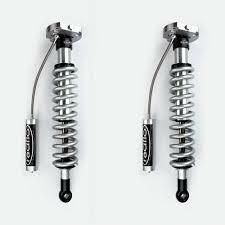 Offers 1.5″ more droop travel over stock when longer shocks are installed. Includes urethane pivot bushings. 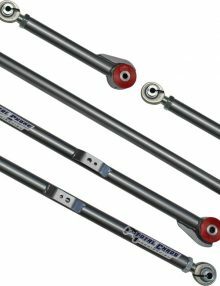 Upper, lower and pan hard bars are designed to incorporate a heim joint making the entire rear link system length adjustable. 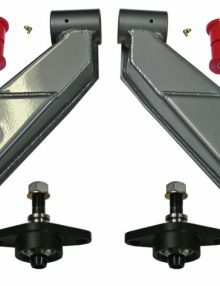 (1) full set of Total Chaos chromoly upper/lower/panhard bar adjustable rear links. This is it. 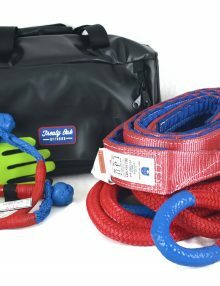 The ultimate in IFS suspension systems. We’re talking about a full race proven long travel front suspension. With up to 12″ of wheel travel, this system combines the comfort of independent front suspension with the wheel travel of a solid axle setup. We combine the Total Chaos race version (+4″ additional width) lower control arms with Radflo’s 2.5″ long travel front coil-overs featuring remote reservoirs and easy click dampening adjustment. There is no terrain this system cannot handle with the proper tuning. From running through the desert at 70mph to crawling the Rubithon, this system will do it all. 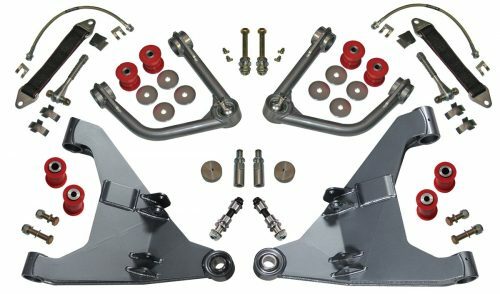 (2) Total Chaos fully boxed and gusseted +2″ track width LONG TRAVEL lower control arms. 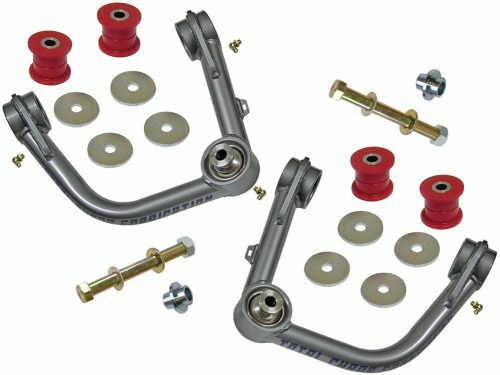 (1) set of Total Chaos chromoly adjustable rear links.